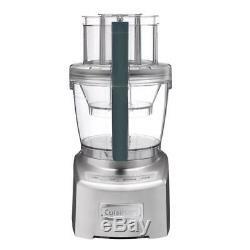 Cuisinart Kitchen Food Processor Elite Adjustable Reversible Stainless Steel New. The Cuisinart Elite Collection 14-Cup Food Processor delivers the next big innovation for the modern kitchen. With a 4.5-cup work bowl nested inside the 14-cup bowl, plus a new adjustable slicing disc, which now slices up to 10 mm, and the reversible shredding disc, it provides home chefs with multiple food processors in one. 1300-Watt provides powerful performance, and the control panel and storage case have been redesigned for a sleeker look. The simplified seal system delivers maximum bowl capacity, plus clean processing and pouring. No other processor does it better. 14-cup large bowl and 4.5-cup small bowl with pour spouts and measurement markings. Exclusive SealTight Advantage system seals bowls and locks blades. Easy on/off locking system with push button release. Stainless steel adjustable slicing disk (up to 10 mm). Stainless steel reversible shredding disk (fine/medium). Large and small stainless steel chopping/mixing blades with blade lock system. Wide-mouth feed tube and covers assembly. Electronic touchpad controls: On, Off, Dough, Pulse with blue LED lights. Accessory storage case with lock, spatula, and recipe/instruction book are included. : 15.75 Product Width in. : 13 Appliance Type: Processor Blade Material: Stainless Steel Color/Finish: Die cast Color/Finish Family: Metallic Carbon Detachable Spindle: Yes Dishwasher Safe Parts: Yes Features: No Additional Features Full-Size Feed Tube: Yes Locking Lid: Yes Product Weight lb. The item "Cuisinart Kitchen Food Processor Elite Adjustable Reversible Stainless Steel New" is in sale since Monday, January 8, 2018. This item is in the category "Home & Garden\Kitchen, Dining & Bar\Small Kitchen Appliances\Food Processors". The seller is "epicdeals2919" and is located in Luckey, Ohio.